A balmy welcome from Rome lures the buoyant traveler into its ancient arms, steeped in history, art, culture and spirituality. Our first stop at the Salesianum reminds us that in every great city one may find peace, serenity and a harmony with nature. The palms and umbrella pines invite us into a stillness of spirit and encourage a prayerful mind frame for our pilgrimage. Our sojourn at the Basilica of St. Paul Outside the Walls in Rome is an integral starting point on our path to spiritual renewal. Paul the apostle, whose own journey was changed by the grace of God, was martyred and buried outside the walls of Rome in the first century. His followers erected a shrine over the grave, but later it was the Emperor Constantine who discovered the secret burial site and built a church in 324 A.D. The present Basilica was built over the site of the original church later in the 4th century. We learn that a Basilica differs from a cathedral in purpose. A basilica is a special church consecrated by the Pope because they contain special, altars, or tombs of saints. A cathedral, by contrast, is an official church of the Bishop. The purpose of embellishing the churches with such elaborate décor was to greet weary pilgrims after painstaking excursions to reach their destinations. We understand that churches in Rome such as St. Peter, St. Paul and St. Maria Maggiore are Basilicas, while the church of St. John Lateran is considered to be the official Cathedral of the west. We awaken on the 5th of October to a classic Italian breakfast of Crostata, purposeful Espresso coffee and pastries. Our leader, Bret, guides us to the Catacombs of St. Callixstus along the Appian Way. As we approach the intersection at the entrance to the Catacombs we see the church of Quo Vadis on the left. This humble chapel marks the spot where Peter, after escaping from prison in Rome, heads down the Via Appia and encounters the risen Jesus. He asks Jesus, “Quo Vadis? Where are you going?” Jesus replies, “I am returning to Rome to be crucified once again.” Peter understood this to mean that he himself was meant to return to Rome to be crucified. Our stocky bus maneuvers carefully through the gates to the ancient catacombs and we find ourselves bathed in amazement at the antiquity of the mausoleum drawing us deeper into its vault of sacred burials. Before entering the chamber, a white dove flies overhead, reminding us of why we have taken this journey. We are escorted into the grotto-like quarters housing the statue of St. Cecilia, the patron saint of music. Her sculpture lies as it did in death with her throat severed and three fingers extended on one hand while one finger is extended on the other, symbolizing the Trinity: 3 persons, one God. The silent footsteps of many pilgrims tread the caverns below the earth where 500,000 souls were laid to rest, at least 100 of which were martyrs, popes and bishops. Mass for the martyrs is celebrated by Father Bailey in a cavern near the family tombs. He reminds us of our faith, firmly embedded in traditions, celebrations, and the sacrifices of the martyrs. We honor those who died for the beliefs we hold dear and repeat the traditions of sacrifice and celebration through the Eucharist. As we emerge from the darkness of the crypts, into the wonder of Italian sunshine, life pulsates through our spirits infusing us with renewal and strength. 1) How many nuns and priests are in Rome at any given time? 2) Where do the Franciscans get their money from? 3) What the Jesuits are thinking about? On Sunday the 7th of October we are humbled and honored to celebrate the holy Mass in one of the holiest places in Rome, in the chapel in front of the Tomb of the Fisherman, St. Peter, and the Apostle. Father Bailey quotes Matthew 16, “I also say to you that you are Peter, and upon this rock I will build My church; and the gates of hell will not prevail against it.” Father Bailey suggests to us, “If God could build ALL of this on top of Peter, imagine what He can do for us.” Our church was built on the faith of Peter, what can be built upon our own faith? Later in the day we await the Angelus in St. Peter’s Square. Pope Benedict XVI appears at the window of the papal apartments and bestows his blessing on the crowds assembled there. Our travels continue to Assisi along a road which parallels the Flaminia, another ancient Roman road built over 2, 000 years ago. As we meander the mountains into the region of Umbria, Bret points out that we are passing the town of Narni, Italy, where C.S. Lewis visited and became inspired to name the setting of “The Lion, the Witch, and the Wardrobe” Narnia. Assisi towers above us, in its medieval glory as a stark reminder that we have traveled a long way to a very special place where the blessed soil gave birth to Francis, the saint of Assisi. We tread on the very pavement where Francis walked, prayed, wept, laughed and transformed his life into a living example of message of Jesus Christ, the Word of God. We assemble at the foothills of Assisi at Santa Maria degli Angeli (Saint Mary of the Angels), the church which holds within its very heart the tiny, archaic Porziuncula, and the precious place where Francis prayed with his friars in the 13th century. Sister Katia, a Franciscan nun we meet in the Piazza of Santa Maria degli Angeli greets us with warm smiles and a plethora of significant Franciscan concepts. Securities become the starting point from which she launches her discussion about changing our lives. Assisi, on the hill above, is surrounded by protective stone walls guarding the city from those who are unwelcome to enter. Below, in the piazza where we stand, is where St. Francis and his early brothers lived and prayed, without the benefit of secured Assisian walls. Sister Katia asks us to reflect for a moment on our own securities. “Give a name to your securities,” she says. Is it our homes, our families, our jobs? The poignant question surfaces, “Is God our security?” In our lives, do we place emphasis on earthly securities? She asks, “Where is your heart?” When we find ourselves in crisis, perhaps it is God that may take away our securities. The vocation of Francis is the Gospel of Matthew Chapter 10, when Jesus names the twelve apostles, calls them together and outlines their mission: “Go after the lost sheep, proclaim the kingdom of heaven, heal the sick, cleanse the lepers, do not possess gold, silver, or money, for your journey you do not need to take two coats or pairs of shoes, when you enter a house say, ‘Peace be to this house.’” Francis took these words to be his Word. Sister Katia asks, “What word from Scripture is MY word?” She reminds us that the miracle of the Word is to LIVE the Word. We are called to follow the word as witnesses. Priests, nuns and religious wear garments and habits that exteriorly demonstrate their vocations and beliefs. As for non-religious and lay people, we wear no exterior garb to display our internal spirituality so it falls upon us more greatly to live the witness. We often hear a voice within us reminding us that we are sinners. When we perform a charity, the voice recalls our sins and the voice becomes “the accuser.” We listen to the voice to remain humble in our good works. Sister Katia explains that the Plenary Indulgence we may receive at the Porziuncula restores us to the purity of the first day of our Baptism. When we were baptized there was a magnificent light that shone from our eyes. At some point the light seems to go out. When did we lose that light? The message of St. Francis is to restore that light to our eyes through Peace. The miracle of St. Francis is that we become instruments of Peace. Jesus Christ is Peace. By opening our hearts and allowing Jesus to work through us we become His instruments of Peace to others in the world. As life may become too heavy, we pray to God to say, “Stop,” and after many years of this pain, in one minute we may lose our life, so it is very important for us to tell the temptation voice to stop. Francis sets this example in the garden of the roses. Francis is overcome by the pain of temptation and vanquishes the invitation to sin by rolling in the roses and thorns until the temptation ceases. He purifies his body as well as his mind and leaves himself open to allow Jesus Christ back into his spirit. In this way our lives must become a sign of another presence, the presence of our Lord, Jesus Christ. Can someone look at my life and see it as a sign of Christ? By letting Jesus use us we become as a sign, a witness; and this is Sister Katia’s wish for us: that we may be able to look in the mirror and see the sign of Christ in our reflection. This is the Joy of Life. Can someone tell you are a Christian by looking at you? Francis died near the Porziuncula, outside the secure walls of Assisi, within the security of having lived his life as Jesus Christ asks us to. We are guided through the cobblestone streets of Assisi where 800 years earlier, Francis’ own footsteps preceded our own. Can we walk in his footsteps as we make our way through our pilgrimage? Can we fill his shoes as we stride through the intricacies that life presents us with once we leave this special place? Francis’ wish in his lifetime was to have the honor of being martyred, of giving his life for the faith. But God wanted to work His miracle through Francis’ life, and not his death. The sign of the Tau became Francis’ symbol representing his life-long devotion to the passion of Christ. It became a sign of his pledge to serve the least of humanity. Francis’ message, like that of Jesus, opposed the common thought that the world is Bad, and pronounced that the world is Good, that Creation is Good. Through his life Francis brought heaven down to earth, and thereby influencing the world on many levels including art. The 2-D images of Byzantine iconographic art are transformed to the pivotal force of the Renaissance where the other-worldly becomes real. We hear stories of Francis and the wolf of Gubbio where the townspeople were frightened by a menacing wolf until the day Francis comes along, speaks to the wolf and tames it. The wolf represents our fears. In Francis’ message how can we find the faith to tame our own fears? Our discoveries on the pilgrimage through Assisi include the history of the Hill of Hell, where criminals were once executed in the region – the place of shame becomes the place of honor as the church is built on the hill to transform death into the hope of new life. Our travels through Assisi take us to the Chiesa Nuova, in the area where Francis was reputed to have been born. The little chapel of San Francesco Piccolino stands just behind the Chiesa Nuova, possibly a stable at one time, and the place where Donna Pica was told by a pilgrim to go and give birth to her child, Francis. She gave the baby the name John, for John the Baptist, but when Peter returned home he renamed the child Francis for he had just returned from France. We see the cell where Peter imprisoned Francis following the beginnings of his conversion and strange behavior. We travel to the Bishop’s residence where the showdown occurred between Francis and his father, and Francis decisively relinquishes the final attachments to our earthly life, his own parents. Francis’ continues to rebel against the corruptions of society and the Church and vows to live in poverty in order to achieve the poverty of spirit necessary for his bond to Jesus Christ. A visit to the Basilica of Saint Clare is as simple as the beautiful young woman who sacrificed the life she could have had to follow in Francis’ footsteps. At the foot of the steep hill leading from Assisi down to San Damiano we embark on a descent through the lush Assisian panorama into the simplistic world where Francis hears the words of Jesus telling him to rebuild the church and where Clare spent the remainder of her life. Wiggling and squirming along the serpentine roads of the Apennine Mountains of Umbria we resumed our travels towards Cascia and Norcia. 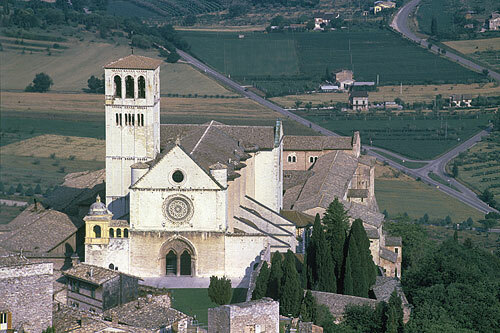 The Augustinian Monastery in Cascia, the site of St. Rita’s home for the last 40 years of her life, also embraces the Basilica of St. Rita where she is buried. The story of Rita of Cascia reflects on her early life as a wife and mother. Her husband, a harsh man is murdered during the turmoil of political struggles. Her two sons, taking an oath of vengeance against their father’s murderer, are thwarted by Rita’s prayers. She prays for her sons, that they should receive the grace to forgive their father’s murderer, or that God will take care of her sons and prevent them from falling into mortal sin. Soon after, Rita’s sons succumb to illness and die, whereupon Rita enters the Augustinian convent. She must first convince her family to allow her to enter the vocation to which she has been called. Upon her entrance into the convent, her mother superior asks Rita to water a dead plant and, obediently, Rita cares for the plant daily until one day, the plant is restored to life and grows to this day in the courtyard. St. Rita was given the gift of the stigmata, a visible sign on her forehead where one of Christ’s thorns had pierced her skin. She suffered the pain of this stigmata until her death. The visible sign remains on her incorrupt body housed in the Basilica where many pilgrims come to ask for her intercession for impossible cases. She is also known as the Saint of Roses. We are told that as she lay dying, she prayed fervently for a sign from God that her sons had been forgiven. A relative visiting Rita on her deathbed is sent to retrieve a rose from the garden, even though it is winter and the ground is covered with snow. Rita’s kinswoman goes to the garden, reaches down into the snow and pulls out Two Roses and returns to Rita before she dies. St. Rita remains the patron saint of families and those who suffer from extreme headaches. Our pilgrimage continues to Norcia, a town blessed with the return of the Benedictine Monks in the year 2000. Upon our arrival in the Basilica, we hear the voices of the Benedictine monks filling the church with the sounds of the Gregorian Chant. Upon our arrival in the Basilica, we hear the voices of the Benedictine monks filling the church with the sounds of the Gregorian Chant. Our hearts are filled with the beauty and wonder of this age old tradition as our souls are infused with the love of God, through the many ways He bestows His blessings. Father Cascian invites us into the 1st century Roman crypt where officials of the Empire conducted their business. So it was that Benedict and Scholastica’s father, a Roman Praetor, came to be in the town of Norcia. Their mother, a native of Norcia gave birth to the twins in 480 AD in the far corner of the crypt, close to where her husband would have been conducting his affairs. The frescoes reveal the beauty of the angels whose hands are covered with cloth, so that they might not directly touch something that is so holy. Father Cascian tells us, “The birth of Christ is seen as a rebirth of people. The birth of Benedict is seen as a rebirth of Christians.” In the 5th century, the Norcia area was full of monks, living in hermitages and monasteries all around the region. It is probable that Benedict was taught by the monks in his early years before being sent to Rome for a formal education. He internalized the teachings of Jesus Christ and passed them on through his own teachings. This is what we must all learn to do. It is said that when his sister, Scholastica, died, Benedict saw her spirit rise to heaven as a white dove. Monks served the community through education, written manuscripts and preservation of documents. But the very real contribution of monks is that of the monastic tradition. They are trained to love God freely in their interior life. It is vital that they learn to deal with their own vices and sins in the interior life, so that what becomes visible is the spirituality of our faith as seen through our traditions. The interior life of lay people can resemble that of the monks through ascetical preparation for prayer by acknowledging the seven deadly sins: Lust, gluttony, greed, sloth, wrath, envy, and pride. We do not deny our vices but confront them head on, so that we may move on to purity of heart that frees us to pray. Call it interior warfare, if you will, so that by first ridding ourselves of our human baggage, we become spiritually liberated to worship God freely. We are given the opportunity to leave behind our securities, build the interior life, and thus becoming exterior witnesses to the teachings of Jesus Christ. The monastery of Norcia was suppressed in the year 1810 because of political upheaval. It was maintained only as a shrine until the year 2000 when the Benedictines returned. Pope Benedict XVI chose the name to honor St. Benedict, the patron saint of Europe, because he recognizes the strong need for evangelization of the continent. The Benedictines gave the Franciscans the chapel of the Porziuncula in return for a basket of fish. To this day, the Franciscans annually present a basket of fish to the Benedictine community. Our farewell to Assisi includes a stop at the chapel of the former leper colony at the foot of the Assisi hills. Francis’ conversion begins when he kisses the leper and everything that was once bitter suddenly became sweet. Francis is drawn to what is unbearable, and embraces it. This is a core concept of his ministry. We are challenged to define “who are the ‘lepers,’ the people we reject?” How do we treat lepers? How can we be more like Francis in our own lives and embrace the unbearable? Our pilgrimage continues through meandering roads that hug the mountains and encircle a landscape so vibrant and green, we are called to reflect on the pilgrimage of life. We often find circumstances in life to be as arduous to climb as these ominous mountains; as we struggle to surmount our difficulties and conquer them. But as we reach the lush green valleys, we are tempted to forget our many blessings until the twists in the road remind us that life is not meant to be a smooth path. . The Capuchin Monastery of Camerino is located in a remote and richly verdant region of Umbria. The first hermitage of Camerino was established in 1528 near the site of earlier hermitages. The chapel exists exactly as it was in 1528. The side chapel was added later. Outside the expansive gardens are the lifeblood of this small group of Friars who live, work, pray, and bestow their generosity on the pilgrims who come to visit them on a drizzly day in October. The Museum at the Camerino Monastery houses some very special treasures. Entrusted with relics, artwork, straw art, wooden tabernacles, and mass articles, the monks take special care of these blessed articles within their custody. As we moved on our way to San Severino, we discovered the liveliness of the Poor Clares. Sister “Mario Andretti” took us on an adventurous ride up the steep hills and sharp turns to the Chiesa Santa Chiara where the sisters lived a cloistered, but joyful life. The Poor Clares fill us with joy, laughter, song and food as they share with us the spirit of their consecrated lives. The separating walls, counters, grates, and altars are a symbol much like a wedding ring, they tell us. People who are married wear a band around their ring finger to symbolize their vocation. The Poor Clares remain cloistered behind walls to symbolize their own, very special vocation: a life of prayer for all of humanity. Without the burdens of riches, worldly responsibilities and material goods, they are free – the freest souls on earth – to practice a holy life of communion with our Lord Jesus Christ. Their generosity and cheerful demeanor infuses us with a spiritual energy never before experienced in the trappings of our modern world. St. James of the Marches was a pillar of the Franciscan movement during the 1400’s. St. James spent his life being devoted as an Observant Friar, performed many miracles and survived 18 attempts on his life by poisoning. While he himself lay dying, the Emperor of Naples asked James to travel to Naples to heal the Emperor’s son. At first James refused because of his own ill health, but when the request came from the Pope to comply with the Emperor’s wishes, James relented and made his way to Naples. After healing the Emperor’s son, James died and was buried in Naples in 1476. His remains were finally returned to Monteprandone in the year 2000. We visited the site of the Eucharistic Miracle of the 8th century in Lanciano, Italy before continuing on our journey to San Giovanni in Rotondo. Padre Pio has had a huge impact on the people of southern Italy, particularly in the Puglia region where he lived, worked and died. The old church where Padre Pio celebrated Mass stands adjoined to the larger church built later, which he compared to a matchbox. A grand church which holds 6500 people was built after his death, and the piazza in front of the church will hold 30,000.